If you're looking to add a large set of constituents to a list from a search that returned 50+ results, use our Bulk Add to List feature! It allows you to quickly add all of your search results to any list, trip or volunteer pool! Start with a search segment that you're interested in. In this example, I've generated a segment with 285 constituents that I'd like to add to a list. Click the checkbox next to "Add all..." which will initially select the first 50 constituents. Once selected, you'll see a light blue bar appear asking if you'd like to "Select all X Constituents" - click to add all. 5. 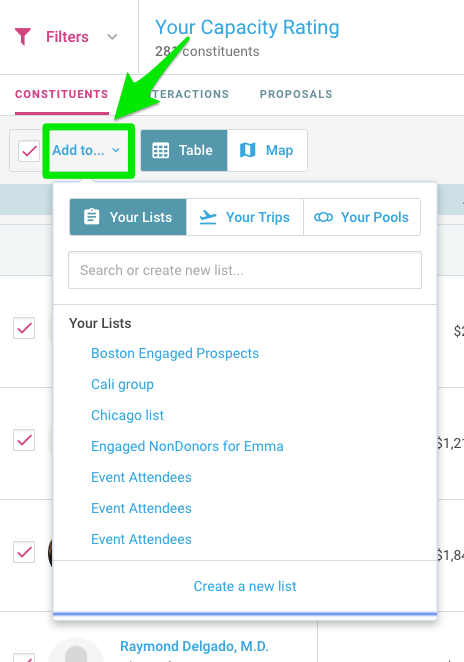 Select the list you're adding to or create a new one to bulk add all of the constituents to that list. It's that easy!